Simple ingredients make this brussels sprout hash easy to whip up and a treat to eat! 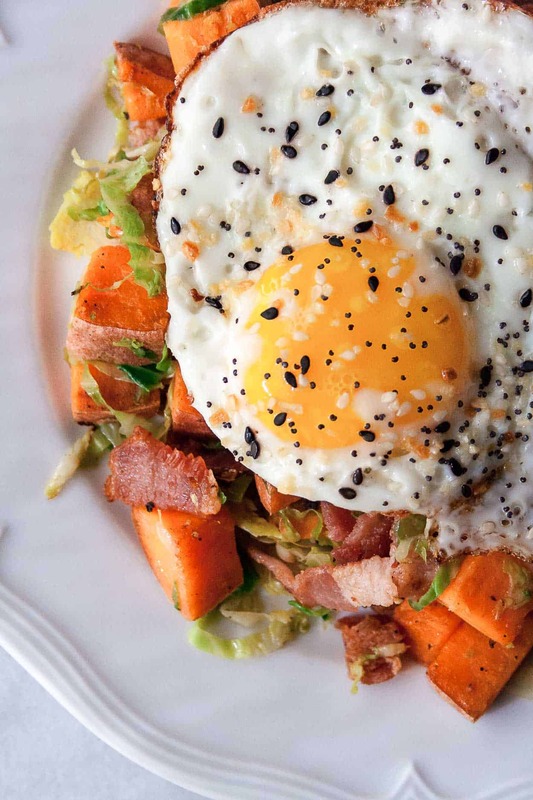 Invite your friends over for a Whole30 approved brunch! Breakfast is officially my favorite meal. I mean, it’s kinda been a long time coming. But this hash really seals the deal. It all started as a kid when we would get waffles for dinner. WAFFLES FOR DINNER. That’s essentially like having dessert instead of dinner and then eating dessert after having dessert for dinner. I would put a single chocolate chip inside of each tiny square on the waffle. And then put peanut butter on top of that. The chocolate chips would get all melty and creamy with the peanut butter. So yea, I’d call that a win. Protein – bacon and eggs. And bacon. Really I just want bacon. 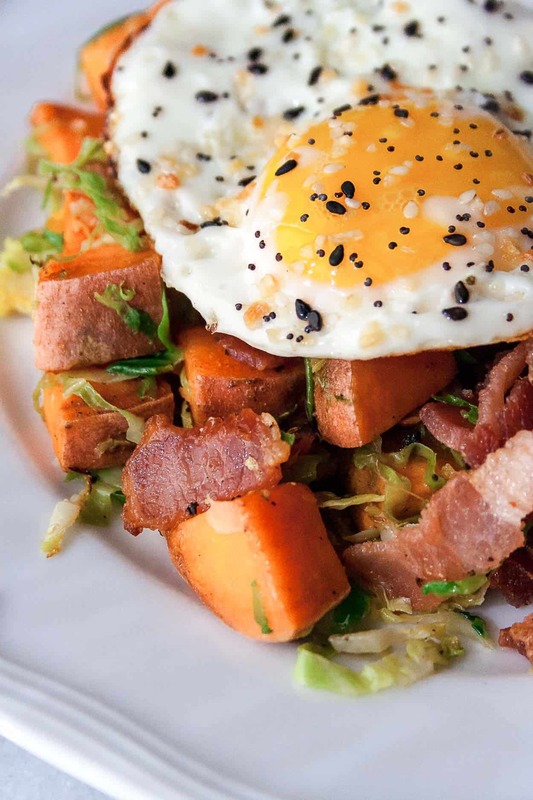 Fiber – brussels and sweet potato. Healthy fats – did I mention bacon fat? And I’m also getting in some good complex carbs from the sweet potato – which is great for refueling after a workout and keeping me full until lunch! And while it is important to include these four components in every meal, it is equally important that your breakfast tastes GOOD. Because I think it’s pretty obvious that I’m not going to eat it if it doesn’t taste good. But seriously. This breakfast is my jam. It is super easy to whip up. You can make a ton at once and have it throughout the week. And you cook the sweet potatoes in bacon fat. Is there anything better?! I have a busy weekend ahead – Granola sampling, dinner with friends, and a night at the opera! For Christmas, I got Pat tickets to the Lyric Opera and we couldn’t be more excited to go! What are you up to this weekend? When you make this Brussels Sprout Hash, post a picture on social media and use the hashtag #imhungrybynature for a chance to be featured! Heat a skillet over medium. Add chopped bacon and cook until crispy. (I like to use my kitchen scissors and cut the bacon right into my skillet.) Remove and place on a paper towel or bag to absorb the extra grease. 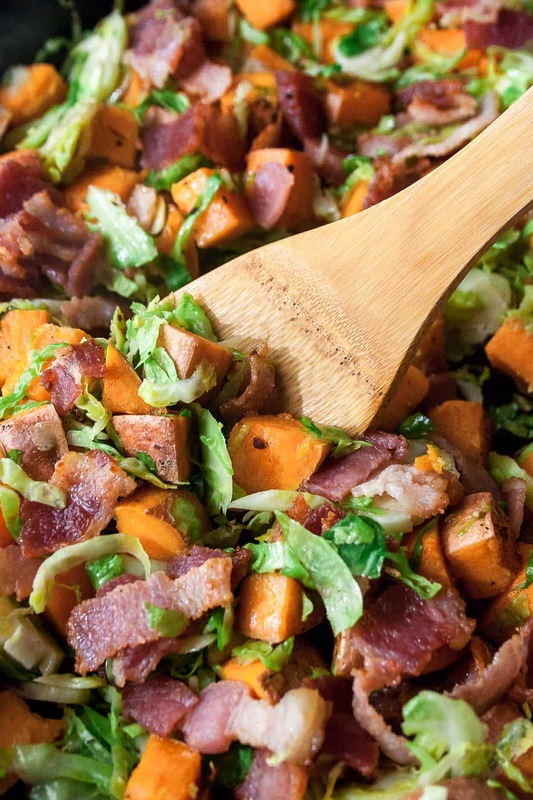 To the leftover bacon grease, add cubed sweet potatoes and season with salt and pepper. Cook until just soft – about 10 minutes. Add brussels sprouts and mix until combined. Cook until sprouts begin to wilt – approximately 3-5 minutes. 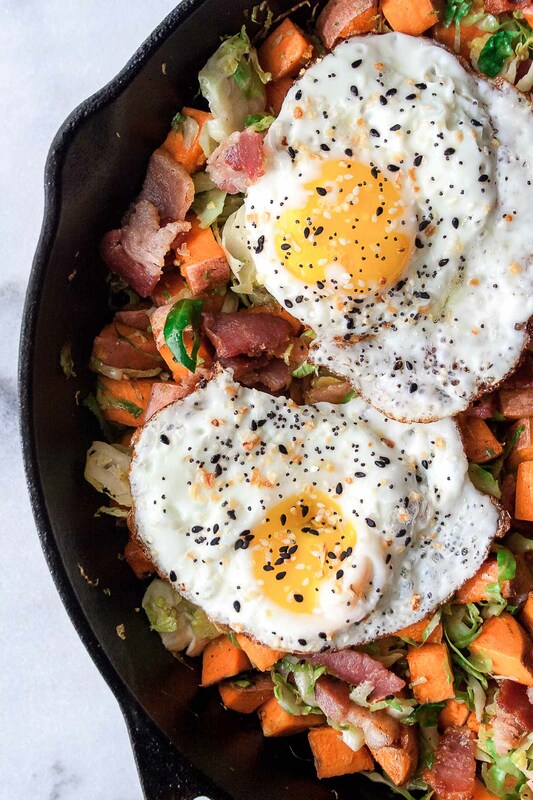 While the sprouts are cooking, fry eggs in another skillet until cooked. I prefer mine over-easy! 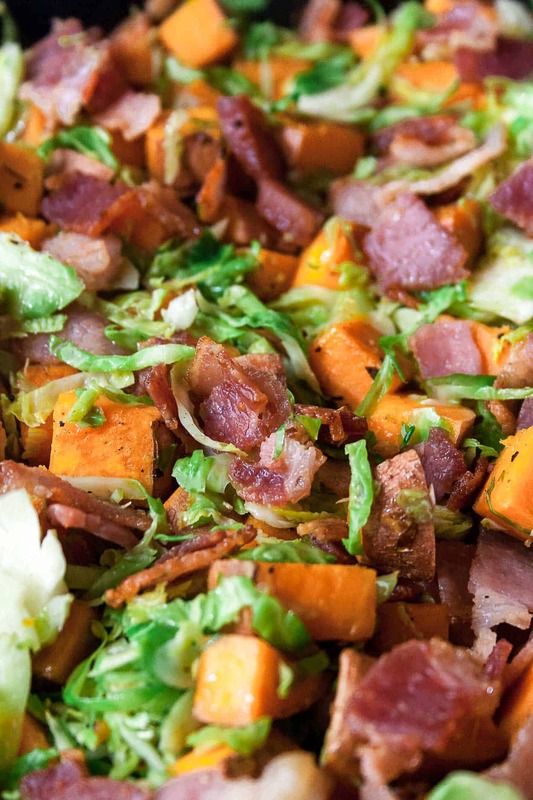 Add bacon back into the skillet with the sweet potato and brussels sprouts. Top with fried eggs. THAT YOLK YO! Make sure you pin this recipe for later! And check out all of my other Whole30 approved recipes on Pinterest! What is it that you topped the egg with? Traders Joe’s everything bagel seasoning? Looks good!